Although I grew up in central New Jersey, I can count the times I’ve been “down the Shore” on my fingers. For one thing, I was (and still am) usually more interested in spending time in New York. Furthermore, I don’t like heat or sun or rowdy crowds, so a trip to my home state’s beaches in the heat of summer has never held much charm for me. But I learned a few years ago that I really do enjoy beaches in my own way: off season, when the weather is mild and attendance is sparse. My husband and I just spent a weekend in Ocean Grove and Asbury Park. It was my first visit to the area in many years, so I took a few pictures. 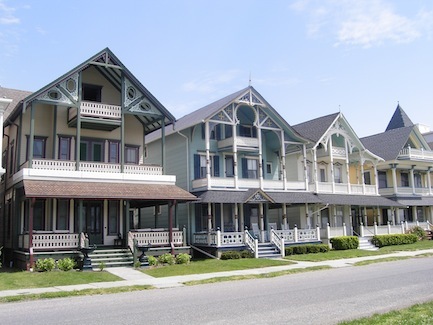 Ocean Grove is known for its nineteenth-century architecture, especially its Victorian homes and hotels. 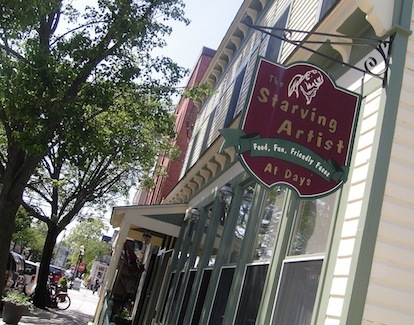 This was my first time in Ocean Grove, and I was amazed to see exactly how much of the town’s Victorian architecture has been preserved or restored: block after block, street after street of buildings with tall windows and shady front porches. 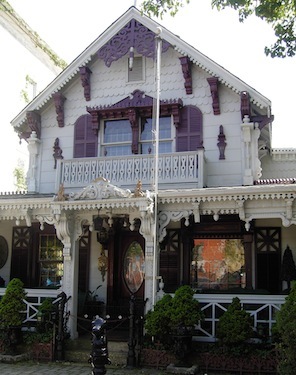 The ornamental woodwork or “gingerbread” on many of the buildings delighted me. Some of it was very intricate, like filigree, not to mention incredibly varied—I never saw exactly the same patterning twice. 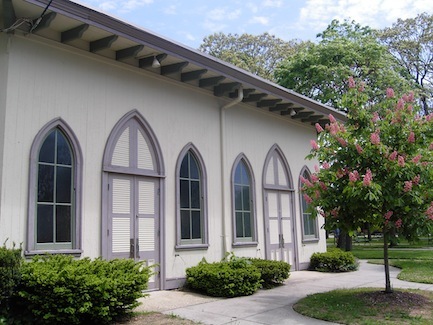 Much of Ocean Grove‘s character stems from its beginnings as a Methodist camp meeting site in the 1860s. Its history is most evident in the cluster of religious buildings around the town’s central square (like the Bishop Janes Tabernacle, above) and in the Biblical names of the surrounding streets. Ocean Grove’s Camp Meeting Association still prohibits the sale of alcohol within town limits, and the beach is closed on Sunday mornings. 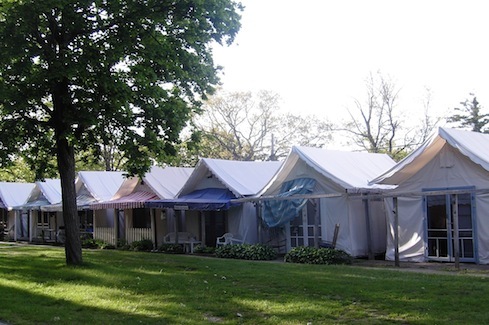 Very different from the Victorian mansions, but just as intriguing, are the rows of “tents” around the central group of religious halls, where longtime congregants live every summer. These rustic-looking shelters continue one of the town’s camp-meeting traditions, and they’re often handed down from generation to generation. 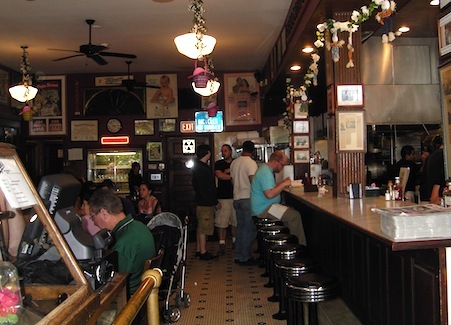 We followed lunch with ice cream at Nagle’s Apothecary Cafe, an old-fashioned drugstore that has been converted into a restaurant. I liked this sign in Nagle’s, although it also made me feel sad. 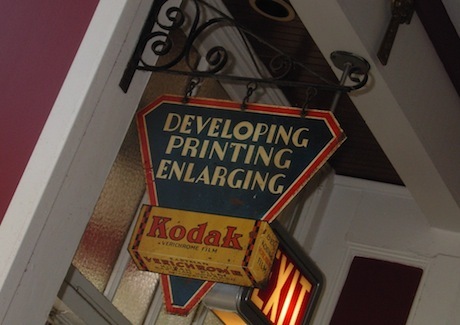 Who would have predicted that Kodak would end up as nothing but an old-timey artifact hanging over a restored soda fountain? Anyway… have I already mentioned all the gingerbread in Ocean Grove? Back to the beach and the boardwalk! The weather was ideal. 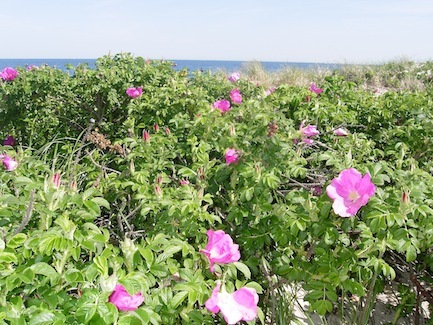 And I was thrilled to come across these roses growing on the dunes. They were wonderfully fragrant. I believe their botanical name is rosa rugosa. 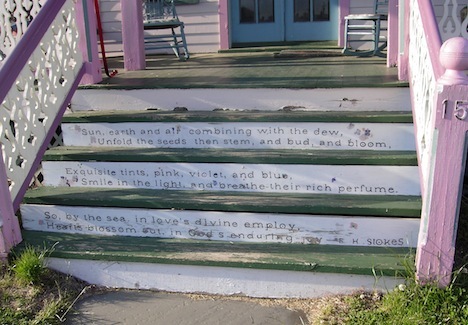 Speaking of scent, I was also happy to spy this inscription painted on the front steps of a Victorian house located less than a block from the ocean. 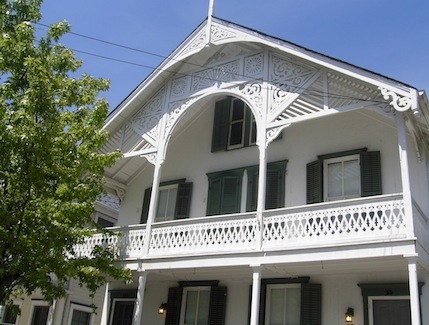 Its author, E. H. Stokes, was the first President of the Ocean Grove Camp Meeting Association. Next: a day in Asbury Park. 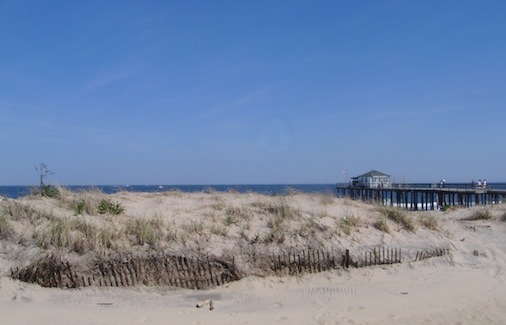 I agree with you on the best time to visit the beach (the shore for NJ speak) is off-season. Growing up there you have a different attitude towards the crowds, the sun, and the heat. Did I mention the crowds? Off-season now is much different than it was 20 years ago but there are still time when you have the town and the beach to yourself. Exactly, Paul! We talked to a few people who bought houses in Asbury Park 20+ years ago, and they all said that the beach was much, much quieter back then, even on holiday weekends. Of course, everything was a lot seedier then, too…! ha.